The 2014 ended on another highly successful show at Chichester with over 300 classics attending. Keep a eye on Events for the 2015 dates - they are now confirmed. 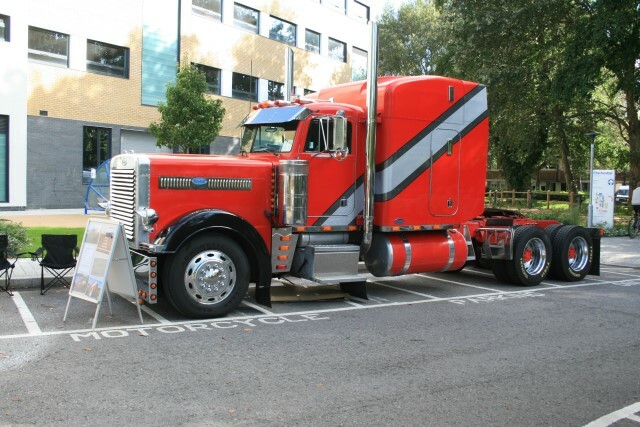 As with the first show of the season at Chichester in April, our September College show was a great success with over 300 cars, light commercials, motor cycles and scooters, and one very large truck! In fact it is probably fair to say that at the show we had the smallest and largest vehicles that we have ever had at a Southern Classics show. 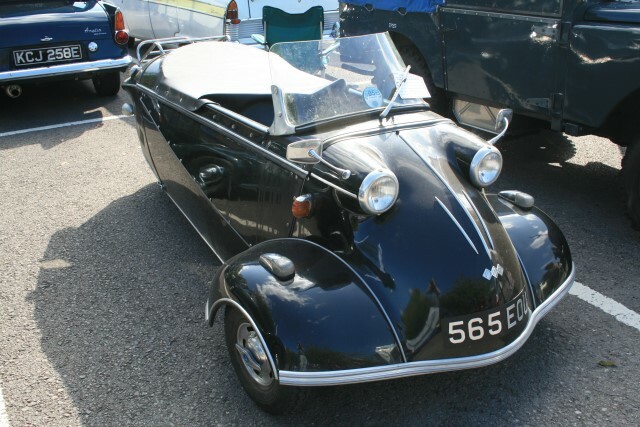 The smallest was a delightful and very scarce 1959 Messerschmitt FMR convertible, belonging to Ian Hopkins, while the largest was Danny Walker's 14.6 Ltr 1994 Peterbilt 379 Tractor Unit. The range of vehicle types, age, values, condition, even colour is always extraordinary with every decade from the '30s to the'00s being represented. 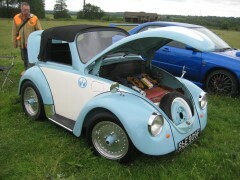 I defy anyone not to find one of their dream classic cars at a Chichester show! 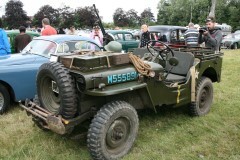 Please click on the link for more photographs of the many 2, 3 and 4 wheeled forms of transport that graced our show. All were greatly admired and enjoyed by the 1000 plus visitors. In addition to the individual show vehicles, we had 4 fellow car clubs turn up with some great cars of their own. The all marques clubs; Sadcase, Manhood, the American car group and Solent Renegade were all most welcome and we always enjoy having other clubs and car related organisations at our shows. The two Chichester shows always attract a good number of Autojumblers that generate a lot of interest from car owners and spectators alike. The large numbers of visitors to the show was also reflected in the number of new members signing up to join the club. Our Membership Secretary, Peter, reported 32 new members had joined which must be some kind of record! Mind you joining at the Chichester show is even better value for money than joining at any other time, as the joining fee not only takes new members to the end of this year, with a Breakfast Meet, Drive-It and AGM on offer, but also includes the whole of the next year. Not bad value for £15 single, or £17 for joint membership. Our 'ladies in the tent', Sue and Barbara, also reported brisk sales for the raffle and regalia respectively. With our 2014 show season well and truly behind us, we turn our attention to 2015 when on Sunday 12th April we will go back to college at Chichester for the first of our six static shows of the year. If you can't wait 'til April, we will be having Breakfast Meet at the Sea Lane Cafe Goring, West Worthing in March. Many thanks to everyone who came and made it a fantastic last show of the season - looking forward to seeing you all next year at the start of season show at the same venue. Click here for 300+ photos. Same location, different place - again!. I started last years report with these words as we had moved to a different 'pitch' but this year we were back to our old plot. 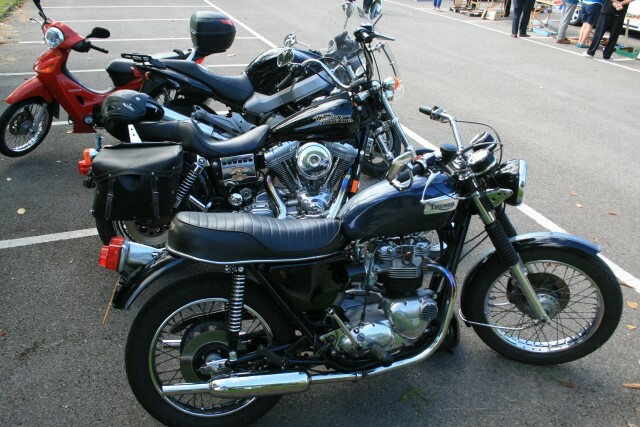 At this time of year we often clash with a lot of other classic car shows and this was no different. The day started slowly but steadily but got busier as the morning went on until there was a queue of classics and visitors waiting to get in. One helper was quoted as saying "it went bonkers". One of the nice things about the Rugby Club meet is that it attracts a number of vehicles who 'saw the signs' and thought they would 'pop in'. 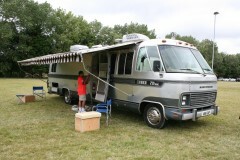 This year was no different and we had a lot of vehicles we had not seen before. 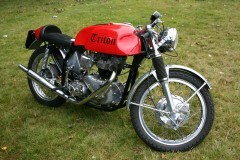 The variety ranged from the small: a 1960 Norton Cafe Racer motorbike in beautiful condition, which won the 'Specials' prize to the huge American Airstream motorhome. The owners Jan and Ted were very welcoming to people who wanted to have a look inside this home on wheels and the committee were happy to present them with a rossette to show our appreciation for entering into the spirit of the 'friendly and informal' club that we are. On this theme we had lots of comments about what a friendly and relaxed meeting it was and how enjoyable it was just to wander around and chat to friendly people. We not only received these comments from people with car at the show but many visitors, of which there were many. 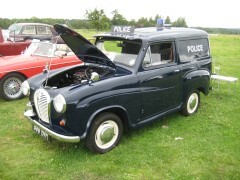 Unlike many shows we are 'open' as to what consitutes a 'classic' and so we get a wide variety of different styles of vehicle - in addition to those mentioned above we had a WW2 Jeep with machine gun, a rare 1999 Nissan Stagea and a VW Camper van - not the normal type we are used to seeing, but one which looked like a small caravan. The "Black Sheep Car Culture" club (or 'almost a club' they told us) came for the first time with an eclectic collection of cars including a Granada based hearse, a multicoloured VW Golf with a skulls head on the roofrack and a Merc with the full hydraulic 'american' suspension who drove onto the field with one wheel off the ground!. The rain showed its face for a short moment so we could play 'how many members can get in the Gasebo"!,but went quickly and was replaced with bright sunshine for the rest of the day. The Visitors Vote selected a Black 1998 VW Beetle, with a Borgward Isabella as runner up. For a full list of all winners please see the next Newsletter. Many thanks to all who came and made it a really good day - hope to see you at the last show of the year in Chichester next month. Our annual show in support of the Dame Vera Lynn Trust for Children with Cerebal Palsy is always one we hope good weather for. And it was - slight threats of rain but ony threats - and it was warm - very warm. The first non committee car to arrive was a TR7 and a non-member who had seen the signs - and he was keen arriving before 09:00. The owner had only just started to get the car on the road and didn't have too many contacts with classic cars so this was an opportunity to meet with the club and other like minded members. By the end of the show he expressed how helpful and friendly people had been and had been give a lot of advice. This is a busy period of the year and we normally clash with a number of other shows - this year Amberley and the Mini's on the Rec at Shoreham, but people arrived slowly and the temperatures started to climb. Some 110 classics arrived over the day and a steady stream of visitors, many who had just seen the sign and came in. Our regular burger van team also brought an ice cream van - a new venture for them, and certainly a very welcome addition as the temperature climbed. We look forward to seeing it at the next shows as well. As is usual with our shows a number of interesting and different vehicles arrived including a Citroen Horse Box which has been converted into a mobile home which got a lot of interest. One of the differences with the charity show is we do not have our normal set of 'decade' prizes, only a 'Best in Show' - The Bennett Trophy - chosen by a 'peoples vote'. This Trophy is in memory of Brian, our long term friend and previous Membership Secretary. This year it was won by another long term member with his beautiful 1930's Riley - and he won the special prize in the raffle - tickets to the Goodwood Revival - now that was a good day!. The photo above shows Alan, the Bennett Trophy winner, with our Chair Garry, and Brian's widow Phylis with her grandaughter. The committee would like to thank everyone who attended the day to support our charity. And also to the people who helped to catch and repair the gazebo when the breeze got under it and it took off!! Thank you. Following on from last years success at the National Trust Sheffield Park Gardens site we were looking forward to another successful show. Unfortunately, troubles were ahead: instead of the place we were given last year and told we would get this year, the National Trust decided differently and sited us in their overflow carpark - a bit grassy, a bit bumpy and a bit further than we would have liked from mat the last moment moved the goalposts. But enough of the troubles, the day brought a good number of cars - over 160 covering a wide range of years and types, including a very shortened VW Beetle, an A30 (A35?) Police Van and a TR4A with a hatchback which had moved to Gibraltar and now returned back to the UK.